This is a photograph and the name of it is Narcissus after Caravaggio. 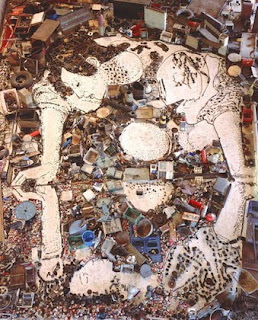 It was done by Vik Muniz and the size is 7'5 1/16 by 5'11 7/8. It is made out of chromogenic color print. This artist likes to use nature and enviornment. He takes unusal objects and forms something than it becomes a photograph. "Muniz's series of Picutres of Junk is based on Old Master paintings of the gods and heroes of classical mythology." This was modeled by a famous painting done by Caravaggio the Greek hero Narcissus is looking a his reflection in a pool of water. He is portraying vanity. This image is on the floor of a hangar on the outskirts of the Rio de Janerio. The piece was made of nuts, bolts, bottle caps, soda cans, discarded tires, wheelbarrows, rusty signs, car doors, and other materials. Muniz had assistance from art students from impoverished neighborhoods where he was directing them from a platform forty feet off the ground. The photo was taken from a downward shot. I like this photograph because it is unusal but, I like that you can see the person's reflection and that you can see a figure. I liked how he used unusal objects to put it together. It is a different photograph but that is what I like about it. I bet in person this piece is huge.